Rent vs. Buy: Tools, Textbooks, Caskets? We often convince ourselves that purchasing an expensive item will be worth it in the long run – it’ll pay for itself and save money with use over time. Then, several years down the road, you’re filling out a Craigslist ad, hoping someone will take it off your hands for a deplorable pittance compared to the original price you paid. Sometimes, though a purchase would fulfill that overwhelming desire for new stuff and instant gratification, renting is the sound financial choice. The following are a few items you can save hundreds on by renting or borrowing instead of buying outright, as well as circumstances that warrant shelling out for your own. That 12 inch Heavy-Duty Compound Miter saw would probably look awesome sitting on your workbench, but how many times are you actually going to build a deck? Judging by the way things are going, probably just once. At several hundred dollars a pop, you’re most likely better-off renting one for a few hours from a place like Home Depot. When buying is worth it: If you truly use a variety of tools on a regular basis, it’s worth it to have your own set. Anyone with a passion for carpentry, home improvement or cars should have a tool chest with their name on it. Every girl knows, you can’t be seen in the same outfit twice! Your daughter’s prom or any similar event requires evening wear that will likely thereafter be sent to the back of the closet for eternity. Instead of dropping several hundred dollars for an overabundance of chiffon and sequins, borrow a designer gown at 90 to 95 percent off the retail price. When buying is worth it: If you’re the sentimental type and plan to hang little Suzy’s prom dress next to her wedding gown some day, you might as well just buy it. Also, if your profession requires your attendance at many high-profile or black tie events, a few key pieces that you can accessorize differently are a sound investment. Most reference materials your professors require you to buy will serve as a cumbersome paperweight at best when the semester is over. Many college students save money on books by purchasing them used or from discount online retailers like Amazon rather than the university book store. Even so, the thriftier option for starving students comes in the form of online textbook rental companies. Chegg.com is currently the number one source of textbooks for rent. They offer free shipping both ways, and better yet, plant a tree for every book borrowed. When buying is worth it: There are a lot of great reference books in existence and some are worth holding onto for life. Anything relating to your field of study that will serve as an important source of information you will repeatedly turn to later in your career (like the physician’s bible, Gray’s Anatomy) should be an expenditure. OK, this one may seem excessively creepy at first, but consider funeral costs today. When buying is worth it: If you just can’t bring yourself to honor a loved one in a casket that’s been “broken in,” go ahead and splurge on a new one. This guest post was written by Go Banking Rates, bringing you informative personal finance content and helpful tools, as well as the best interest rates on financial services nationwide. Follow them on Twitter at @GoBankingRates and on Facebook at /GoBRates. Thanks for the info. I had no idea about Chegg.com, I definitely am going to look into that one. We have rented tools and such in the past and it was great. Places that rent out tools usually keep things sharp and perform all the maintenance, so you don’t have to worry about that when you rent either. Renting textbooks that aren’t related to your field is one of the most cost-effective things I’ve ever discovered. I also used campusbookrentals.com. Same concept–they even have free packaging & shipping both ways. Strongly disagree. Buying is always better than renting, if you ask me. Let’s take a powe drill. I could own it for, say, 30 years? In those 30 years, how many times would I have to rent it before I exceeded the purchase cost? Not to mention how many times I lend it to friends and family, or the cost in petrol of driving to rental place and back twice each time. Or for that matter, just the convenience of having it in my garage. If the rental shop closes down, how far away is the next nearest one? I’d rather buy, I prefer ownership to renting. It’s also in the way of an investment. Sure, it may only sell for 1/10th the price in 30 years, but if you’ve got a lot of tools and need to raise cash you can still sell them. Textbooks you should RENT! From my college experience, I have not touched them all they are useful for two reasons: (1) Collecting dust (2) Taking up space. I have come to a point where I brought loads of books and I am not using them to this day. I am strongly thinking about the KINDLE but I am unsure of the product. And it is more buying the book than renting. This is debateable!…lol We all know that you are able to read books from it but are there other things to it I am missing. Someone please advise me : ). @ Andrew, I agree with you regarding buying but I am assuming your talking about life long things as a powe drill, a house, a car. These items I would buy because you NEED them. Renting a home or an apartment in my opinion is beneficial if you know your not going to be in a location for long but if you been in a location for 15 years and your renting, I may question…. @ Carol, I have a bunch of textbooks that I don’t use today because at my college, which I cannot speak for all, I for example, have to purchase a history book for that semester and two semester down the road, they updated the book and it was as profitable for the students at my college at the time. Of course you can sell them online but I know its going to be a hassle on my end..ugh! Any websites or suggestions for selling? quickly? @TODHD, I love you! Renting is worth it. I have DVD’s but I may have watched 3 of them 5 times and then don’t watch them anymore. I now rent at the $1 DVD machines. I agree with these – especially the casket. I actually know of a few families that have rented caskets because of the costs. It seems creepy at first, but no one besides the family members planning the funeral will know anyway! @andrew – totally agree. if it’s something that will be used consistently, buying is almost always the better option. Renting vs/buying is definitely dependent on the situation. I think the whole point to the post is if you are planning on using an item for a one time or short term use then buying really is not the most practical (or cost-effective) way to go. Obviously a carpenter by trade or an avid woodworker would want to own his tools. However, if you were building a deck maybe renting would be a better option for short term. A good example for me would be the professional carpet cleaners we use to clean rental properties. I pay $25 for a 24 hr time period and I rent about 6-10 times a year. A new unit would run around $1500 and I have been renting for about 7 years now. At first glance doing the math I could have practically bought my own by now. But in my defense I have not for the following reasons: 1) I don’t want to store the big bulky machine at home (it is a BIG boy)…2) since I have begun renting the rental store has bought new machines and upgraded twice. If I owned my own machine I would still have the same old model getting older every day and losing its cleaning ability. For me it just makes sense to continue to rent. 3) I have no maintenance or upkeep of the machine. If it breaks it is not my problem. (and I have had them go down during a cleaning which I just grab another and continue on). As for caskets, I think renting is a great idea but then again my family has been instructed to bury me via ‘green’, meaning that I will be going in a cardboard box. I will be dead and gone so I don’t really care how they handle it. I used to tell them they could just throw me out in the back field but I guess they have laws on that one. @finallygettingtoeven – oh my gosh, i read your first paragraph and started thinking about carpet cleaning. crazy. anyway, i read somewhere that people should clean/shampoo their carpets twice a year. i think renting a steam cleaner is also about $25 at our local grocery store chain…so that’s $50 per year for me max. I’m a renter and I definitely would not purchase a carpet cleaner since i eventually want hard wood floors in my house. not a good long term investment for me, and i bet it would be hard to sell a used carpet cleaner for close to the purchase price. Ever hear of a “slip casket”? After graveside services a switch opens the bottom of the coffin and the body lands in the hole. I read about these in a novel set in 19th-century Scotland. Me, I’m going for cremation. But I agree that some things are better rented than owned. How often would most people use power washers, really? A casket?!? That’s just weird. Never heard of renting one before, but they sure are expensive! agreed. most of the times it’s best if you’re NOT the pickup truck owner. The cleaners I am talking about are about 2 x’s the size of the ones you get at the local grocery store and 10x’s more powerful. Next time you need one go to a ‘tool rental center’ and get the big commercial ones, they will cost you about the same and do an even better job. ah, gotcha. Nice! i was thinking of those Rug Doctor ones http://buy.rugdoctor.com/carpet-cleaners/rug-doctor-machines.html hahah! yea next time i’m going to rent from a tool rental place. thanks for the tip! Textbooks I usually buy used and then resell. I will check out renting them some more but one I came across that I will need this fall cost more to rent than retail price! What’s up with that?? I think it just depends on the person and situation–I am usually all about ownership but there’s definitely some instances where renting would be the better financial choice. I would venture to suggest adding Motorcycles to this list. If you are a weekend warrior, or like me, and every other month and normally just in the summer, type of rider, owning costs way to much. Absolutely agree with your reasoning. I would say that you should rent (or borrow) ANYTHING YOU CAN the first time before making the decision on whether it will be worth buying, and factor in a LOT more things than a napkin-guess of how many times you might rent something before an “owned” version might break. 1) The obvious: Do you need to customize this item in a way that precludes rental at all? 2) Do you live in a small place with a high cost of ownership per square foot or like keeping your space uncrowded? If so, how much is that worth to you over time? 3) How much do you enjoy repairing/maintaining/replacing these items? 4) Do you like having the newest versions of something, or is a 5/10/20/30-year-old version just as good? I think there’s even a third angle here, certain jobs you just hire out. I have rented items from the local machine rental outlet. I hate this process. They make you fill forms out in triplecate and make a big fuss about all their rules. I remember doing this, it took 30 minutes to rent a lawn aerator. I walk out back and this greasy guy pulls out a greasy unit from the back. I swear he filled it with gas while he had a cigarette hanging out of his mouth! For my carpet cleaning, I have mine cleaned twice a year for 200 dollars each time. Obivously, I could own a Dirt Doctor every year for this kind of cost. BUT, these guys come in and move furniture, clean every carpeted surface in my house and take only about 2 hours total. I’d never get it done that quick, not to mention all the steps. It’s worth it to me to allow me to do those project that I DO enjoy to pay the 200 bucks. I always make sure to use that 2 hours on something I WANT to do, then it doesn’t feel like a waste. Same with lawn treating. I have TruGreen do it. It costs easily 3x more. But, I do alot of OTHER work on my lawn and that’s why people always say I have the best lawn in the neighborhood. In the end, you have to make smart decisions about what makes the best use of your dollar bills and minutes. Looking back now, I’d totally rent textbooks, or at least buy them and sell them immediately after the quarter. I still have them today, and they’re not worth anything because they’re out of date. For that reason, I don’t think I’d ever buy and keep a textbook. Updated versions come out all the time. Thx for this great guest post Danielle! Lots of buzz and links around town – Consumerist AND Lifehacker – you rock. And for me, I’d totally put a House up in here. Much rather go back to renting and feeling more free than “owning” ;) But we all have our own preferences. 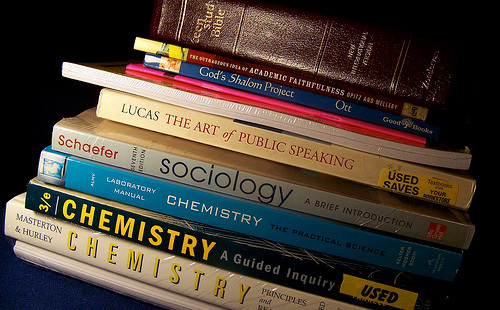 Textbook rental is more costly than buying and reselling. The market for used books is extraordinarily efficient and offers resale prices far in excess of what can be found in any other secondary market. It is literally impossible to do better. There may be outliers, but for the vast majority of texts and all of the commonly used texts in lower level courses, rental will end up being significantly more expensive. Anybody who claims otherwise is going on poorly informed anecdote. That is why as a textbook retailer I will be offering rental as soon as practicable, because students will pay more for it. I’ve thought of another one that some people are renting – the washing machines. Well, not washing machine which you would take to your home and return, but going to the laundrettes. If you are a student, or you have a very small apartment – that’s an OK choice. but if you have an OK sized apartment, then I would recommend buying one. The reasons are these: no one will steal your stuff, you can do whatever you want while it’s spinning, I haven’t heard of any major revolutions in washing machines for the past 10 years, so it is possible that there won’t be any in the close future. So, unlike the carpet cleaners – it’s worth it. + you can always share it with your neighbours. Or even earn money washing it for them. Hah! Very true. As long as you have pockets full of quarters and a lot of patience ;) I ran out of both after 2 years living in NYC. To an extent I have to disagree with the text books. Last time I went to rent the text books I found that renting cost about the same as buying them used, maybe a little less/more. But when you buy a used book, even for 10 bucks more, you have the ability to resell it and you have the insurance that if anything happened to the book you wouldn’t be charged full price (If you rent it they charge you the full price minus the rental charge. Don’t take in consideration getting a new book since no matter which scenario you would have to get another one). First step should be checked used prices vs renting, if renting is significantly cheaper evaluate your ability to keep the book presentable and decide. Never buy them new unless you have to. The suggestion about cremation makes a lot of sense 36% of funerals in 2008 were cremations and they cost about 1650 while a more traditional burial costs about 7300. One could then have a nice wake on some of the difference. I notice that more and more indigents are getting cremated as the government realizes its cheaper. In addition you can have a memorial service at a more convenient time enable more extended family to make the service. Most students think that renting is always the best option. But think again! It is good idea to compare textbook prices before deciding if a student should buy or rent textbooks. Renting is obviously is good option when it is considerably cheap to rent than buying used textbooks. Rented textbooks have to be returned by the due date. A late return may incur fines as high as $10/week. Textbook rented from companies should be kept in acceptable condition and without excessive high lighting. Buying used textbooks allows you to keep the book in whatever condition you wish to. At the end of the semester you can sell it or decide to keep it as reference material. If you decide to sell your textbooks you will usually receive at least 60% of the price if had purchased your textbook wisely. Let us now use a price comparison website (UsedTextbookPrices.com or AffordTextbooks.com) to compare buying used versus renting. The above book is cheapest buying international edition. The difference is rental and used textbook price is just $14 indicating used textbook buying or just purchasing international editions are better option. The above book is cheapest renting. But buying used is better option because at the end of the semester you are sure to sell this book for at least $35. Rent is good option if you want no hassle. The decision to buy versus rent should be based on the price comparison and other factors discussed above. If you have pets that frequently tear and chew book, my advice is to buy cheap used textbook than renting.